Rawr, says the Dethrone Defending Tank. Summer ain’t over yet, especially in most parts of the Golden State! 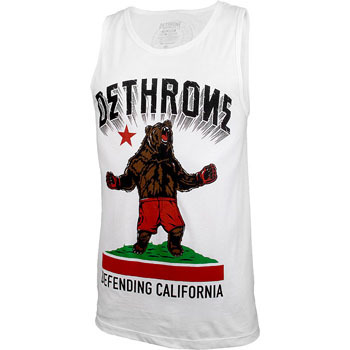 The Dethrone Defending Tank is a new release from Dethrone Royalty, featuring the symbolic California bear presented in a new light. Instead of being on all fours, the California bear is standing up roaring, with MMA gloves and shorts on! MMA Sleeveless Shirts have never been cooler! The Dethrone Defending Tank is available at MMA Warehouse.